From 1861 to 2018 how much has changed? In 1861 our country was divided. Divided over the rights of our citizens (slavery) and divided over the philosophical differences of two segments of our country, each segment having distinct beliefs and views that conflicted with the other. The American Civil War lasted 4 years and at the cost of over 620,000 lives not to mention the cost of rebuilding the southern states for over 20 years. Sound familiar? Today it is not the North vs the South, or those that were opposed to slavery vs those that depended upon slavery in order to maintain their wealth. Today it is the Republicans (Conservative Views) vs the Democrats (Liberal Views) and make no mistake this civil divide is just as intense and devastating to the peaceful future we all deserve as the civil war was over 150 years ago. Worse yet is our civil divide today is not based upon geographical locations, where 384 individual battles took place, that defined and resulted in the deathly impact of the conflict on our nation. Today’s battle takes place not only on the streets of every city across the country, it takes place in our homes, work places and even places of worship. Our public officials are even protested, verbally accosted, while attempting to relax and eat dinner at their local restaurants. And through social media and main stream media, the battle is refueled daily and continues to go on. I can’t remember in over 40 years of Presidential elections where after the election was over that Americans did not come together in peace and in acceptance of the outcome of the Presidential election. And mark my words, Wayne’s Take, this battle is NOT simply a dispute over President Trump. The President is being attacked by those with wealth and an agenda that is well hidden. Their agenda is NOT to make America Great Again, it is to continue to make their families the real power base over hundreds of millions of people by controlling our lives in such a way that WE are enslaved to their purpose and their mission for decades to come. Wake up America…. this civil war must end. Conflict (disagreement) is part of the human condition for sure, yet hatred is not a necessary part of our lives. Peace, Love and Forgiveness are the elements that allow us all to live together in a world we desire and deserve. As I watch Fox News (Pro-Trump) and CNN (Anti-Trump) and CSpan, I can clearly see and hear “with eyes and ears” the hidden agendas being played out by those we have elected or those hired in an attempt to re-direct our attention away from the opportunity we have before us to bring our Country around and set the stage for the future prosperity of our children and grand-children. Republicans are not the problem. Democrats are not the problem. Our thoughts and actions represent the problem we face, when such thoughts and actions are not in line with peaceful resolution of conflict, open dialog towards the future of our country as a whole and not simply serving a small elite group of families that have orchestrated the direction of our country over the past 100 years. This is not a conspiracy theory …. just reality and as a 30 year veteran of the investigative and criminal justice system, working with government agencies and Fortune 100 financial giants, I have been given a unique opportunity to witness the inside story. Trump is playing the media and doing quite well at it. The media is playing the America people and have excelled at this for decades. No matter what our President wants to do, the Democrats will oppose it and vote against it. Why? Simply this… POWER! The do not have it and they want it back. Their loyalty is not to you or I. It is to themselves. And the Republicans in congress are the same, they stand in power today and they want to keep it. However, today the political game has a new card in the deck. It’s the Trump card. And this card does not support any political side, it uses the Republican side as a front in order to get its agenda passed because Republicans represent the majority in power. So this is where OUR focus should be today. We should come together and vote, support, debate (never physically fight or attack the rights of others) over the issues that are of real concern to us and our families. These issues are… our homeless. Our veterans. Our healthcare. Our children. This is where we debate against child abuse and we support their education. Yes… these are just my thoughts as I watch this theatrical performance play out in the halls of congress, town halls and rallies across the country and as the politicians stand before the cameras and read their well scripted lines designed to lift up their voices and authority to all that will lend an ear. It does not matter what the current administration achieves during these 4 years… it will be 4 years of a civil war environment if WE THE PEOPLE do not put an end to it. North Korea peace treaty …. a win for the Administration. The Economy… a win for the Administration. Tax Reform a win. Low unemployment a win. Yet the main stream media, the Democrats and those with something to loose if Trump wins, will continue to redirect our attention to yet another crisis that they claim Trump is responsible for. The purpose is simply to have us take our eyes off the cards on the table which reflect America is winning again. Please for the sake of our children and our children’s children…. open your hearts, your mind and use your eyes and ears when doing so in order to perceive the reality around us. Do not be lead by those that would deceive you for their benefit, but rather be lead by faith, hope and love. God bless. Matthew 13:16-17 – “But blessed are your eyes, because they see; and your ears, because they hear. “For truly I say to you that many prophets and righteous men desired to see what you see, and did not see it, and to hear what you hear, and did not hear it. Whatever you may be thinking, let’s get one thing straight. America does NOT need another career politician. We have been losing ground for the past 50 to 100 years. We are no longer the strongest, most powerful nation in the world. And indeed, we should be and can be again. However it will never happen with career politicians playing business as usual in Washington D.C. If you read through my posts, articles and reports over the past 10 years you will find my writings to be absent any political overtones or strong opinions of local or national candidates. My position as a consumer advocate has directed me to be middle of the road and stay clear of the right or left on Capitol Hill. Basically, I can only be effective at my work for consumers if I do not “tick” anyone off in office. I have been approached virtually every year to lend a hand, provide an endorsement or otherwise voice my support for one candidate or another. This is not because I have the ear of millions, I simply provide one more “assumably” creditable source for candidates to point to in media or online searches. 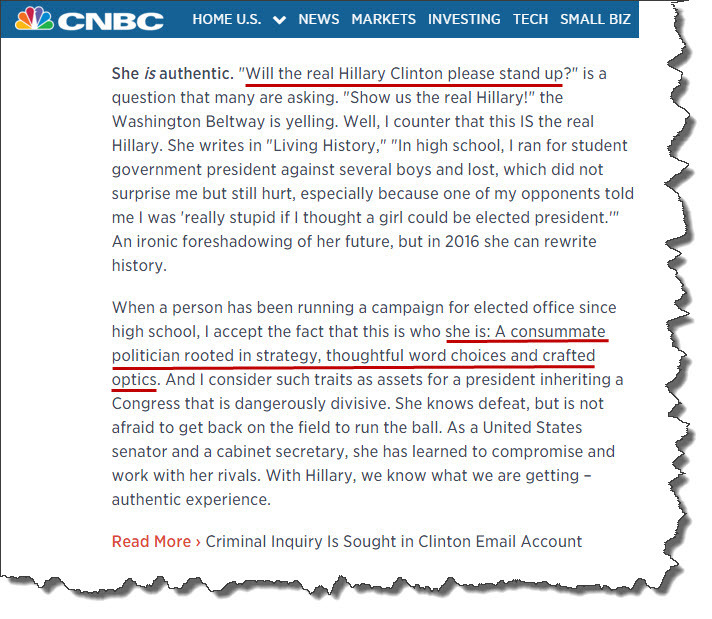 However, I am writing today and voicing my personal opinion after reading this endorsement for Hillary Rodham Clinton as our next President of the United States. This simply made the hair on the back of my neck stand up and had me reeling in my chair. Disclaimer: Back 5 years ago I did lend my support to a local candidate for the office of County Attorney, based solely upon his heartfelt position in saving the lives of those being abducted and transported over the boarder from Mexico into Arizona. That was the last and only endorsement I have made since my decision to serve Americans as their advocate. So in keeping with my history of staying in the middle ground, let me say this article is NOT a measure to bash Hillary Clinton. I am not a fan, supporter nor do I plan on voting for her in this coming election. My choice of candidate for the Presidency will remain my own. However with that said, here is why I would strongly hesitate to vote for Hillary or any other candidate for any office in Washington D.C. that has been in office “politic” during the past 10, 20, 30 years or more. Simply put, the system is broken. Our country is bankrupt and it was the leaders we elected into office over the past several decades that put us here. It was not Uncle James the local baker in town, or Bob the mechanic down the street, or Susan the real estate agent we see each month at chamber meetings, or Pastor Joel that talks to us about faith on Sundays. Our lives, our livelihood, our children’s future and that of our grandchildren have been systematically destroyed over the “business as usual” politics being played out in our nation’s capitol. For most of you reading this, you may agree based upon your own personal take and experience with how your life and finances have been hit so hard over the past decade. Or simply you have watched as our national debt has gone from billions of dollars to $21 trillion dollars and with no possible answer in view as to how to reverse this process. For those of you that have yet to realize what I am referring to as the “career politician”, let me provide these personal insights. And… hopefully non of my dearly departed relatives will turn over in their graves as I write this. Our country became great because James the local baker, Bob the wagon fixer, Pastor Joel and even Susan the store clerk “when at a time her personal options were limited” each took it upon themselves as Americans to step up to the table to make our nation great. To fight to ensure our liberties, preserve our freedom and protect our future. The majority of those in congress and the While House ran for office to serve a term necessary to fulfill an objective and it had NOTHING to do with their personal benefit, securing public speaking gigs or retiring with more wealth than they had when they started. However today Washington D.C. is filled with career politicians that started as Hillary did running for office in College and she has never stopped running and she has become a part of the Washington machine. When she gets into trouble she calls upon political favors to bail herself out. When she is confronted with a difficult question as to why we lost the lives of our troops she calls upon the curtain that interestingly covers up the wrongs or mistakes that happen every day in the world of politics. What we need “IMHO” are Americans that have no other objection than to fix the broken system we have and save our child or grandchildren from the future we have saddled them with. I say we saddled them with, because it was during our watch that many of our elected officials ran afoul from the oath of office they took. We can fix America. We simply need to elect the right people to office and hold them accountable to do the job they were elected to do. In closing this is my food for thought. Donald Trump is not just running for office, he is the front runner at this point. He does NOT need the job. As a matter of fact I can not for the life of me think of anyone that would want the job as President, considering the massive mess and cleanup our next President will face. This is why it is NOT simply the Presidency that requires a fresh view by a non-career politician, it is as many seats we can replace in congress as well. How do I know all this? Why is my opinion so strong on this issue? Because I grew up there. In Washington D.C. with family members and family friends in most every level of government. I grew up in the middle of the political machine. I was being groomed for it and thank God I was redirect to the consumer side of the equation where I do my best to protect and preserve consumer rights not take them away. So all I ask is this….. before you vote, think about why the person you are voting for is running for office and are they truly for change, not just business as usual, or are you helping put into office someone that will continue the next eight (8) years of increased debt, increased government oversight, decreased consumer rights and basically same old same old philosophy that placed us where we are today. What America needs is you… and your vote. The choice is yours and remember… “Together we CAN make a difference!” God bless America. The big question on everyone’s mind is who won tonight’s Presidential debate. So let me answer this now before it begins. And as you can see by the posting time… I am writing this before the first answer. The President won. Why… 1. The Presidency is an institution and the President has the advantage coming into a debate. 2.) He has not told us, up and until now, how he will fix the problems in our country and today I believe he will do so since Mitt Romney will “strategically” not have the ability to counter it. Unfortunately they are now debating, so I must end this now and will be back with the results. Wow, what a massive upset for the President. “He got spanked!” And keep in mind, I am NOT a democrat nor a big supporter of the Obama re-election campaign. So for me to start off thinking the President was going to walk away the winner tonight was based upon the general starting blocks of the debate itself. Since the media will be covering every point discussed during the debate, I certainly do not need to rehash the entire debate, however here are my personal moments of wow. 1. Where was the President’s eyes during the debate. As Romney was speaking, I continued to see the President nodding his head as if agreeing with the statements, however he hardly ever look at the eyes of his opponent. 2. “They are suffering in this country.” Romney’s expression of the state of affairs with the unemployment and where people are at today. The Governor referred to those in Ohio and in Colorado as a way to connect with those in the critical areas for the debate. 3. Romney came through way better than anticipated. He proved to Americans that he can handle the job and understands where we are at today and where we need to be. Did he fully explain his plan? No! So he has more work to do. The bottom line is this. The debates will be a game changer if the President fails to turn around his performance 180 degrees. This was clearly a win for Romney and potentially for those of us supporting small business owners and a turn around for this country. No matter who wins the election, tonight’s debate certainly was an eye opener for both candidates and if Obama is re-elected, I would like to think this debate gave him a moment to re-think his position with Americans across the board.